My wife, Teri, and I love the Bavarian town of Leavenworth located in central Washington. In fact we love it so much, we’re considering buying a vacation home there and maybe eventually retiring there. I guess now that I’m 44, retirement is (hopefully) closer than it isn’t. There is ALWAYS something to do in Leavenworth. Whether your tastes lean towrd the active side of hiking, biking, skiing, snowshoeing or river rafting. Or the more mellow side of shopping, relaxing, dining and drinking, there is something for everyone in Leavenworth, all year long. 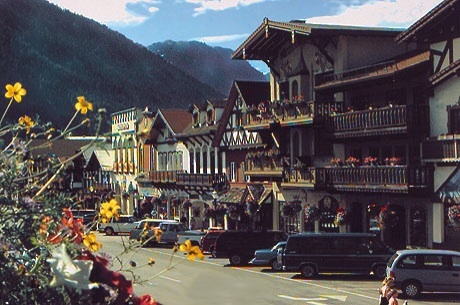 Founded in 1906, the town was a sleepy logging town, just a blip on highway 2 until in 1962, the project LIFE (Leavenworth Improvement For Everyone) committee decided to turn Leavenworth into a mock Bavarian town. (Source:Wikipedia) What a fabulous idea! Throughout the town, all the facades of the buildings were made to look like Bavaria. 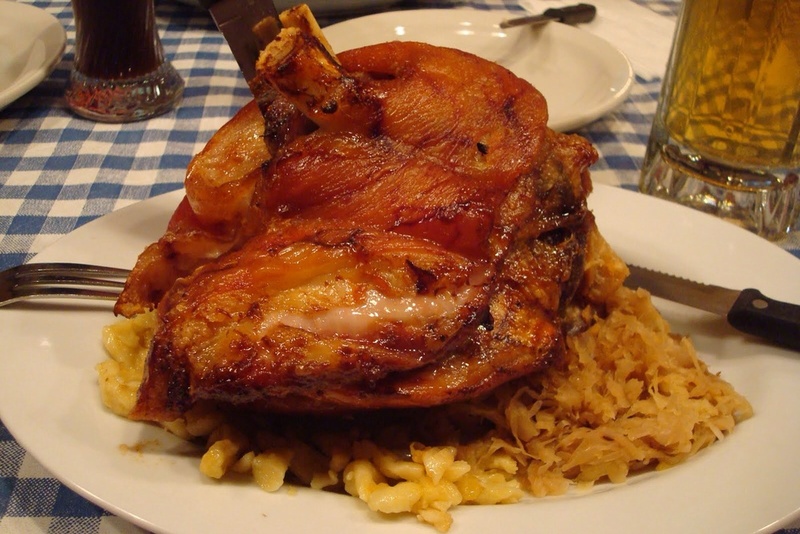 Lots of German restaurants popped up, and accordion sales went through the roof! (OK I may have made that last bit up). But seriously, you can’t walk through Leavenworth on any given night without hearing an accordion or tuba somewhere. It is a lot of fun! Everyone we’ve met in Leavenworth is super nice. We even went to a rotary club dinner and auction last year and had a fabulous time! Generally we rent a home in the town of Plain, WA just north of Leavenworth. It’s about a 20-25 minute drive, but it’s so peaceful there. At night it’s super dark, millions of stars grace the sky, it’s awesome. This year we arrived on my birthday and after getting settled into our home, we headed into town for a birthday dinner. We settled on Visconti’s because I know they have a bone-in ribeye that’s simply scrumptious! We brought along a bottle of Rafanelli Zinfandel to pair it with, and I must say that was an excellent choice! After dinner we were treated to a gelato pie of epic proportions!! It was probably more sugar and carbs than I’d had in a month! It was amazing! (Bet you didn’t know this was going to be a post about weight loss did you?). I only felt mildly guilty for eating it, it was my birthday after all! My goal was to be at 250 by my birthday, and I came just shy of it at 253. The birthday dinner was just the start of my slide into debauchery for the week. I ate gelato, candy, drank wine, drank whiskey, ate jäger schnitzel (twice! ), ate spaëtzle, pretty much when we were in Leavenworth, I didn’t really pay attention to what passed my lips. I even, on the last night in town, ordered a Coke! I have not had Coke in nearly four months! And you know what? It was disgusting! I took about three swigs of it, and it was horrible. So I’m really hoping my addiction for that particular soda has ended. For breakfast every morning, I had eggs and bacon. At least 3 eggs each day and 3+ slices of bacon. The days we stayed at the house, we made dinner there. One night Teri made Cornned beef and cabbage. Another night, we had brats on the BBQ. We had leftover dinner and salads for lunch. It was fabulous!! Our friend Amy joined us on Tuesday and we had an amazing time just relaxing and laughing the whole trip. One day we ventured up to Lake Chelan, hopped on a seaplane and went wine tasting. There is lots of wine and whiskey tasting in Leavenworth too, and I don’t think we missed much of it. We did a five ish mile loop hike out at Icicle Gorge one day!, the scenery was breathtaking! I’m telling you all of this to say, we had an amazing time!! But also because it was vacation, I wanted to enjoy everything Leavenworth had to offer, including the food and drink, and not feel deprived at all. Mission accomplished! I dreaded returning home and facing the scale. I didn’t feel like I had gained a whole lot of weight, but I know my body and generally it cannot go through that without packing on the pounds. Earlier this year at our friend Jay’s home on the sound, I managed to gain 6 pounds in the course of two days! So having gone off script for SEVEN days, I was dreading it. Yesterday was bacon & 4 eggs for breakfast, a protein shake for lunch and Teri made som chicken sausage, asparagus and a salad for dinner. Tasted awesome, and we’re back on script for 3010 Weight Loss. This morning was judgement day. Time to face the scale and see what kind of a hole I’d dug for myself. 255 and change! Not bad, just over two pounds! I’m fairly certain I can get that gone by our official weigh in on Thursday! I think there is a lesson here. While I know I went way off script, I still made choices more in line with what I should be doing. And I think (hope) I’ve gotten some metabolic flexibility back. My body was so used to burning carbs for calories before, that it never tapped into its own resources (fat) for energy, regardless of what I did. For the rest of my life, my diet will consist of low carbs, moderate protein and high fat. But there will be days, even weeks where that ratio will get skewed. But I’ve learned (only took 44 years) what my body needs to thrive and be healthy, and I will always return to that. And before you bash me about the high fat part, or the low carb part, I’d invite you to FIRST read any or all of the following that lead me down this path: Keto Clarity by Jimmy Moore, The Big Fat Surprise by Nina Teicholz, Cholesterol Clarity by Jimmy Moore, Wheat Belly by Dr William Davis, The Paleo Coach by Jason Seib, The Paleo Manifesto by John Durant. I’ve read thousands of pages, listened to hundreds of hours of podcasts, and this particular way of eating works for me. It may not work for everyone. On Friday I’ll get the results of my super cholesterol blood work study, and that will be telling if it REALLY works for me. But past results lead me to believe that I’ll be on the right track. I’ve been off my blood pressure and cholesterol meds for over two months now and my BP is at or often below where it was with the meds. My resting heart rate is slightly higher at 70 than it was at 50, but still super healthy. 50 I may as well have been dead! I have more energy than I ever had before (nearly 60 lbs off my frame has a lot to do with that) and I feel great. So please, rejoice with me. Don’t regurgitate the standard American diet of low fat, high carb, eat more vegetable oil that we’ve been told since before I was born. If that works for you, congratulations, I’ll never tell you to change. It never did, and never will work for me. This does. So until you’ve walked a mile in my shoes my friend….